DEARBORN, Mich., March 21, 2017 – Ford will create the ultimate experience during the Barrett-Jackson auction in Palm Beach, Florida, at the South Florida Fairgrounds on April 6-9, 2017. 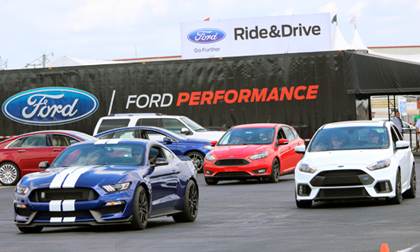 From thrill rides in current vehicles, to static displays of new Mustang and Expedition vehicles, event attendees can connect with all aspects of the Ford lifestyle. One of the stars of the show will be the recently revealed 2018 Ford Mustang, which will be seen for the first time in South Florida. The new model features a host of improvements including new advanced technology like the 12-inch digital cluster and available active valve performance exhaust system. The new Mustang also features a sleeker design with LED headlamps and a lowered hood, and even more performance with increased power, an all-new available automatic transmission for quicker shifts and available MagneRide™ damping system that offers optimum handling on the track. Ford applied its transient overboost technology to the Mustang’s 2.3-liter EcoBoost four-cylinder engine model and uniquely calibrated it to increase torque for wide-open throttle acceleration. The 5.0-liter V8 engine was thoroughly reworked to make it more powerful with increased torque. This power increase was achieved with the first application for Mustang of Ford’s new dual-fuel, high-pressure direct injection and low-pressure port fuel injection on a V8 engine – delivering robust low-end torque, high-rpm power, and improved fuel efficiency. For enthusiasts who crave space, flexibility and technology fit for the entire family, the all-new 2018 Expedition will be on display. Offering technology to keep every passenger connected, more power for drivers, and expected towing capability to rival any other full-size SUV, it’s the smartest, most capable and most adaptable Expedition ever. Auction attendees can learn about some of Expedition’s 40 plus features and driver-assist technologies, including wireless charging, a Wi-Fi hotspot that supports as many as 10 devices at once, and Pro Trailer Backup Assist, that help make the journey as enjoyable as the destination. Barrett-Jackson attendees can also explore various aspects of some of their favorite Ford vehicles. After viewing the vehicles on display, many of them are available for a drive on the Barrett-Jackson closed course or a thrill ride with a professional driver at the wheel. Ford Motor Company has an exciting history with Barrett-Jackson. The last 2017 Ford Raptor was auctioned at Barrett-Jackson, Scottsdale, with all proceeds benefiting the Juvenile Diabetes Research Foundation (JDRF). The sale of this Ford Raptor raised an astounding $207,000.